Lime light productions and Hot FM 105 bring to you the hottest night of summer 2011..... MUZIK MAYHEM.... Live performances (PLUGGED !!!!) 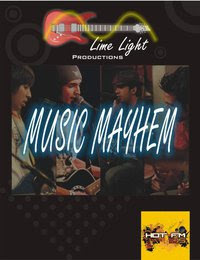 by some of the best bands in karachi... Music Mayhem is bound to give you a thrill you wont easily forget !!!! Music Mayhem, gives you music from every genre, may it be Rock, pop, classical, country or rap... music mayhem is going to be a tribute to every genre that drives people crazyyy !!! W...ild music, blinding lights, mouth watering food, video games and 24 different shisha flavours !!!! Limited passes so grab em quickly coz you'll be sorry to miss it !!! !